"It was 1964," Bob begins, "and I was working at Cooper's. One of the salesmen came to me and said, "Exxon wants a tiger." "This was on a Friday... and they needed it on Monday. I said, "Oh, god, I can't do that - I'm working on another job." ( I was doing a paperback cover). But he said, "Come on, just give it a try." 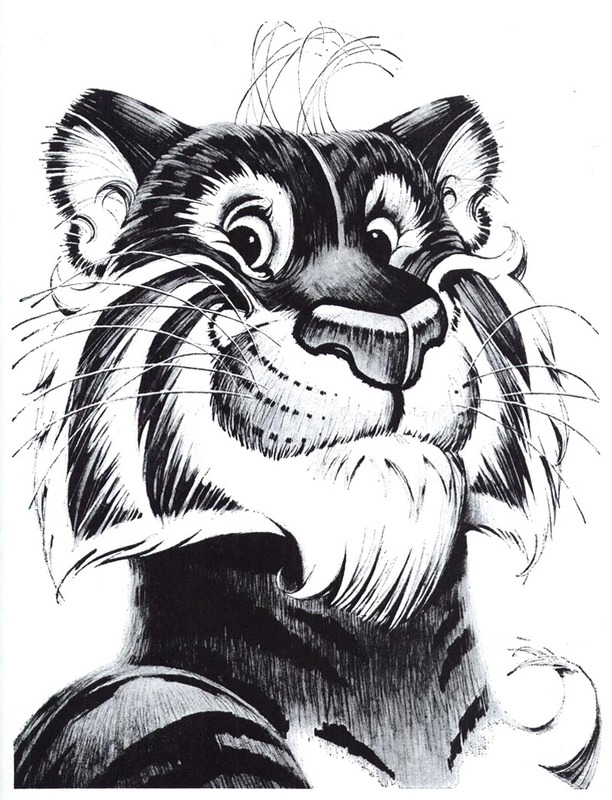 So I went home and I made this sketch of a tiger, and I gave it to the salesman on Monday... and for, like, 4 or 5 weeks we didn't hear anything." 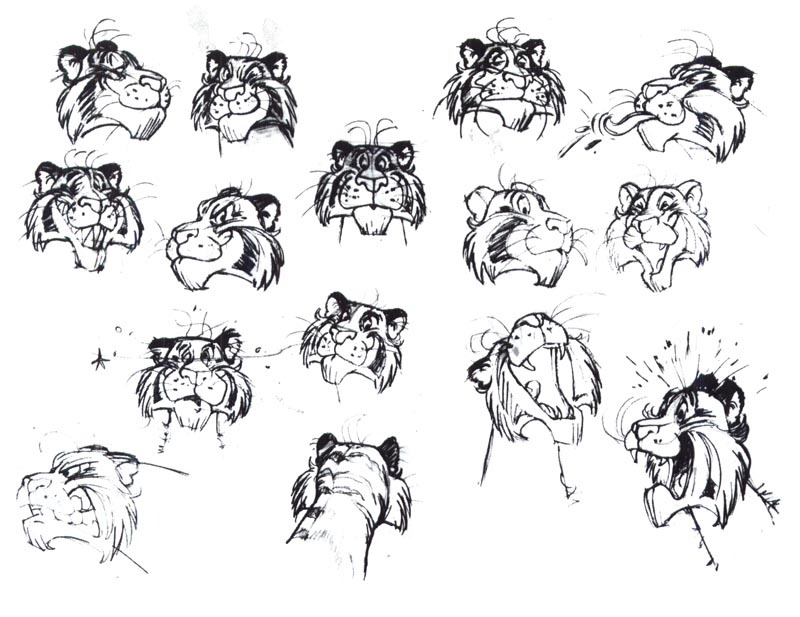 "Finally, we get a call to go down to McCann-Erikson... and I go into this room and there's this room full of tiger drawings pinned to the wall! Every artist in the city (or, I dunno, the country) tried out for this... anyway... they picked mine!" He chuckles, "And I said, "wow, to think I almost didn't do it!" "Well, I was kind of with Chuck at the time (when I did the initial sketch)... and then we didn't hear anything... and then I had left Chuck, because work had really fallen off at the studio. And then all of a sudden the Exxon stuff started pouring in." "One day it occurred to me... I had started this when I was with Chuck, and it was advertising work. So I said, "I owe Chuck some money." So I went to him... and I can't remember what it was exactly but in a couple of months I made something like 8 thousand bucks. And I went to give Chuck half of it... and he wouldn't take it." "He said, "Bob, you keep it"... and then he took me out to lunch." "Chuck was a helluva guy. He was like a father to us." * Thanks to Nick Meglin for allowing me to excerpt the b/w sketches above from his book, The Art of Humorous Illustration. 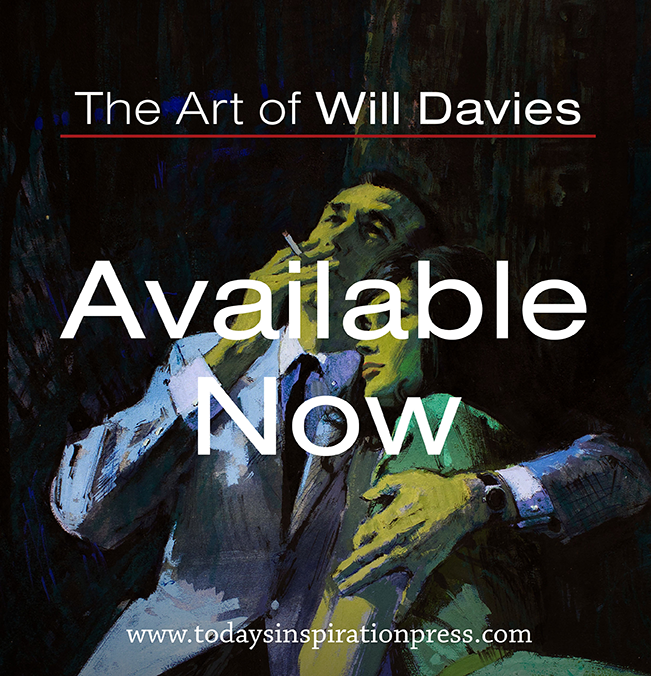 A revised edition, Humorous Illustration, is available and contains much more about Bob Jones, including sections on Bob's materials and techniques! 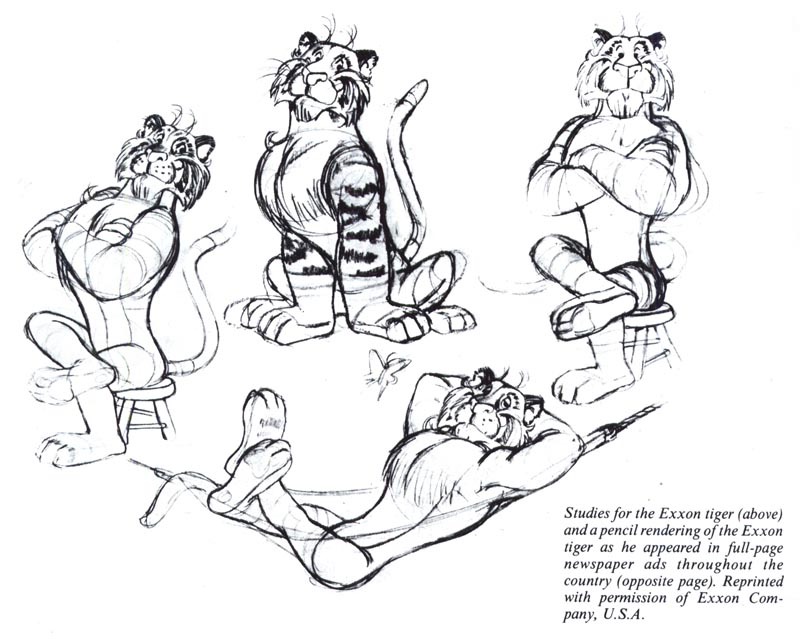 Great - back when illustration and animation crossed over...or do they do that today? Also, re: MacPherson, he was the best best best!!!! Better than Peterson, better than Aislin, better than Norris- and I just me got an original, a long time goal.. copied him shamelessly back in high school. I have all the collections...His widow runs a gallery museum here in Ontario, in Beaverton. Not only is Bob a charming gentleman that I had the pleasure to meet while with Barbara Bradley when she went to the SI for her lifetime educators award but I am reminded by this series just how fabulously versatile and talented he is. 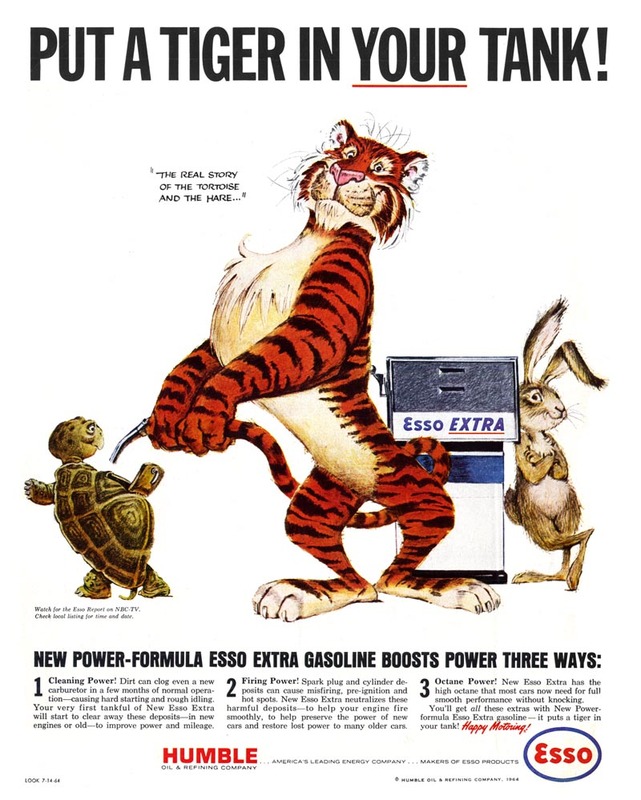 I loved that Esso tiger, which showed up when I was ten. He was much more fun than that corn flakes spokestiger. More life and animation. Beautifully and empathetically drawn. WOW! "Pack den Tiger in den Tank" it was called here. This animal had become very popular also in the German speaking hemisphere. Believe it or not, I still have my Tiger from the 1960's, he's been carefully cared for all these years. L in Ottawa, ON, Canada. I really don't see it much anymore. Sad realy since I feel we miss out on seeing appealing characters promoting adult products like it had been back then (of course when they do, they end up being ugly CGI renderings). He at least gets some attention outside the US where Exxon simply has no use for him. That is my Dad.... You have some really cool stuff, but not sure all the photos are of him. Could be. Thanks for the tribute. I am going to see him on Block Island in two weeks. He is still painting for pleasure. That's cool to hear Pete, tell him I said "Hi!" This is my Dad too... My brother Pete just sent this to me. Pete, those photo's are of Dad. I saw the originals.I was only 4 when the Esso Tiger thing started. I remember we had Esso Tiger costumes that we wore for Halloween. When Dad moved his studio home I remember wandering into his studio in the middle of the night when I couldn't sleep. I would crawl onto his lap and watch him work. When I fell asleep he would put me back in bed. For years I thought Dad never slept because he always seemed to be awake in his studio. Years later I told Dad what I thought. He got a good laugh about that. I feel very lucky to have such a wonderful dad. I am glad his work is appreciated. Tell your dad his work lives on in our hearts!